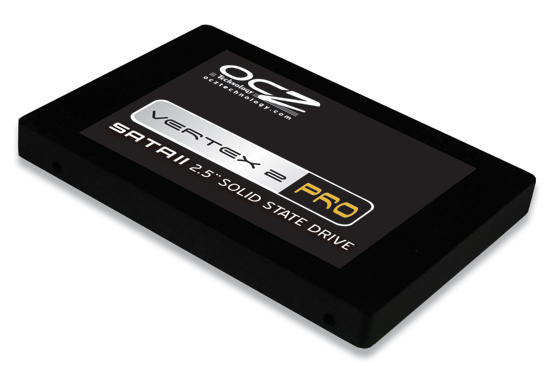 Back in December I previewed OCZ’s Vertex 2 Pro, the first drive I’d tested to use SandForce’s SF-1500 controller. As you may remember, the controller works in a radical way - by reducing the amount of data written to flash it improves performance and longevity, at the cost of controller/firmware complexity. Not a bad tradeoff for a company trying to sell you expensive SSD controllers. If you want to know more about how it works, I'd suggest consulting my Vertex 2 Pro Preview. If you want to know how SSDs work, take a look at the SSD Relapse. The drive made an impressive showing, easily besting any other MLC SSD I’d ever tested. Unfortunately, it was pre-release hardware, with no known price and no set release date. Not to mention that the company who made the controller was shipping largely unproven technology with an unknown amount of reliability/validation testing. Since then two things have happened. “Ultimately, the task of putting these drives to the test falls on the heads of you all - the early adopters. It’s only after we collectively put these drives through hundreds and thousands of hours of real world usage that we can determine whether or not they’re sponge-worthy. Even Intel managed to screw up two firmware releases and they do more in-house validation than any company I’ve ever worked with. The bugs of course never appeared in my testing, but only in the field in the hands of paying customers. I hate that it has to be this way, but we live in the wild west of solid state storage. It’ll be a while before you can embrace any new product with confidence. And second, the OCZ Vertex 2 Pro as a product has been canned. Not because of the issue that lead to the untimely death of my drive, but because the SF-1500 controller is just too expensive. I knew that it was going to be pricey at the time I wrote the article, but apparently OCZ thought it could bring the price down by the time it shipped. Needless to say, that didn’t happen. Instead of the Vertex 2 Pro, OCZ will be shipping the regular Vertex 2 based on SandForce’s slower SF-1200 controller. This SSD will carry a pricetag similar to present day Vertex drives, but hopefully offer better performance. 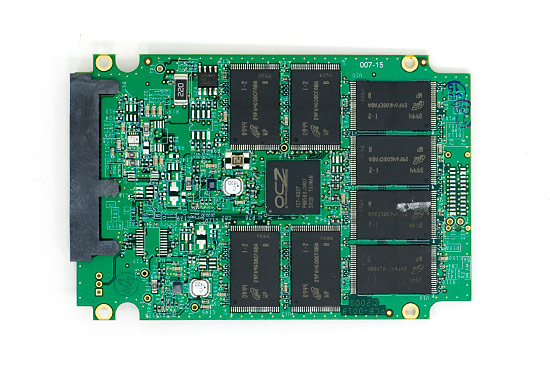 For enterprise customers OCZ will ship the Vertex 2 EX based on the SF-1500 with SLC flash and a ginormous, quarterly-budget depleting pricetag (to be determined). The consumer MLC SF-1500 based Vertex 2 Pro is gone forever. Despite its name, the Vertex Limited Edition is an MLC SandForce SF-1500 SSD (technically it's a SF-1200/SF-1500 hybrid like the Vertex 2 Pro, but that's a separate issue entirely). It's basically the Vertex 2 Pro with one big caveat - there are only a limited number of these drives being made - 5,000 to be exact. Once they're all gone, that's it. My Vertex LE is Serial #1. Ebay, here I come! OCZ apparently got a sweetheart deal on an early batch of SF-1500s. This is the same controller from the Vertex 2 Pro in December, but with an updated firmware (RC1). These are the first drives shipping with RC1 of the SF-1500 firmware and will presumably not die on you after a couple of weeks. While I’ve heard that they may not be enterprise worthy, they are apparently fit for desktop use. OCZ has said that in its internal testing there haven't been any cases of a bricked Vertex LE. The same was not true during the Vertex 2 Pro test period. Now here comes the problem. 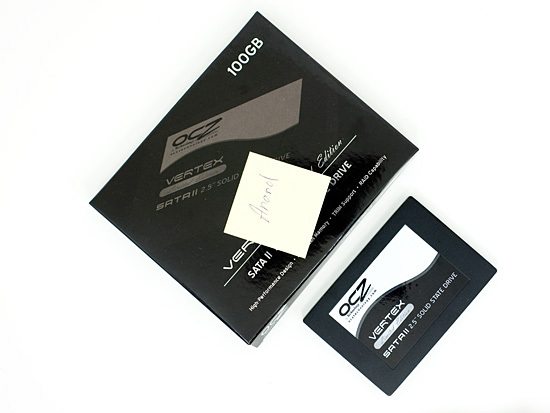 The OCZ Vertex Limited Edition. That's a SandForce SF-1500 controller under that OCZ logo in the middle. I literally just received my drive 24 hours ago. Just like its ancestor, this thing will be put through the wringer for the coming weeks and months. However long it takes to make sure it is worthy of your dollars. The problem is that these drives are limited in quantity, chances are they will all be gone by the time I figure out whether or not they are worthy of a glowing recommendation. For roughly the same price per GB you’d pay for an Intel X25-M G2, you’re getting a much faster drive. The only issue is that its reliability is unproven. To calm your fears, OCZ is selling the Vertex LE with a 3 year warranty. Barring any unforeseen issues, the drives will go on sale next week. Risky business. I should note that we’ve seen vendors get quite opportunistic with hot SSDs in limited quantities before. There’s always the chance that these Vertex LEs will sell for more than their MSRP. The nifty OCZ Toolbox I showed in my Vertex 2 Pro preview presently doesn’t work with the Vertex LE. The application looks for SandForce in the controller id, which is absent from these unbranded SF-1500 controllers that SandForce unloaded. By the time the drives ship though there should be a custom version of the OCZ Toolbox ready. TRIM is supported and works perfectly under Windows 7. Unlike the Vertex 2 Pro sample I tested, the Vertex LE doesn’t have the ungodly expensive capacitor on its PCB. As I mentioned before, these aren’t designed to go into servers and thus the supercap won’t be missed. Performance on the drive is great and I haven’t had any issues thus far in my testing, but there’s a long road ahead of me. The RC1 firmware is brand new to me. I’ll be putting the drive through its paces but given that the units will go on sale next week I decided to share my initial thoughts today rather than wait. The Sandforce Controller has hardware AES encryption, which could be used with OCZ Toolbox (which is not available). It's a self encrypting drive. No CPU Performance wasted with software encryption. It's kinda sad that they will not at least replace the drive with an equal value SSD, I suggest to anybody considering buying any OCZ product to read through there forum before making a purchase!!! People are reporting waiting seven months for warranties on the Vertex series? Today more than ever people are not getting what they paid for and to even post a review of there product is a slap in our collective faces. But I guess Aandtech is selling out too as they have there advertisement up top of this section LOL! I think your characterization of all IMFT flash as equivalent creates a false idea of quailty equilvalence for readers. "It’s uses a standard Indilinx Barefoot controller but is paired with IMFT 34nm flash branded either as Intel or Micron. It’s the same flash that’s used in the X25-M G2s." 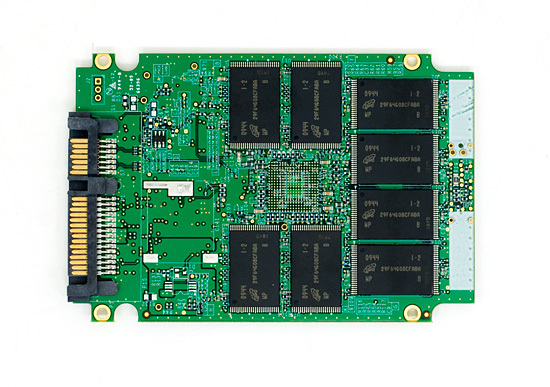 Intel does not sell enterprise-grade or SSD Nand to competitors. It does do more testing on the Nand used inside the X-25M G2s, ensuring it meets a higher quality level. Has anyone tried a Raid 1 (mirror) with an SSD and an HDD? I have a customer with a Dell R410 server which has very limited expansion capabilites, only one expansion slot which has a 4 port NIC in it. They are starting to run into disk I/O issues. Short of buying a new server, I was thinking of Raiding a 500 GB OCZ Colossus with a 500 GB Seagate 7200.12, the idea being much faster reads with failover to the HDD if the SSD bricks. I can't afford to buy the SSD to test this out. What do you experts say? Overclockers UK has confirmed with Crucial that the 128GB version of the drive has a far slower write speed. They've been told that the write speed is up to 140MB/s. Compare this to 235MB/s sustained write on the LE, and 250MB/s max write, and there's no competition. Yes the C300 still has amazing read speeds, but I think the LE is the better all-round performer. Unless we find out that the numbers we've been seeing on the net for the LE are for the 256GB version and have been erroneously attributed to the 128GB version as well. in Final Words, first paragraph, fifth line. This is more for the blog community, than it is for me personally (although I am considering Enterprise SSDs for our database servers). I don't think it warrants your phone time. If you can simply prepare a statement in reaction to the test drive going bellly up at Anantech's test center, which I can post, I think that would be more than enough. 1. CTO's like me are seriously looking at these drives to consider putting their databases on (SaaS based applications can benefit from the performance improvements). 2. We are deathly afraid of the reliability issues, so when initial articles about SandForce controllers came out with the emphasis on reliability, everyone was cautiosly elated. 3. We see a follow-up story on Anantech (arguably THE source of impartial news on hardware), show that the OCZ drive just "died", and I think it's safe to say, there's significant concern. your firm for an explenation beyond "Oh don't worry guys, that was pre-production hardware". As you know, our community is comprised of smart people, and that type of answer just doesn't cut it. We appreciate the inquiry and definitely appreciate your concern. It was appropriate that Anandtech highlight the drive that failed was a pre-production drive. The drive used Beta firmware, which by definition, had known issues. Looking at a Japanese retailer's listing for the RealSSD drives at http://bit.ly/clxvoa">http://bit.ly/clxvoa, the write speeds of the 128GB and 256GB versions differ by around 50%!